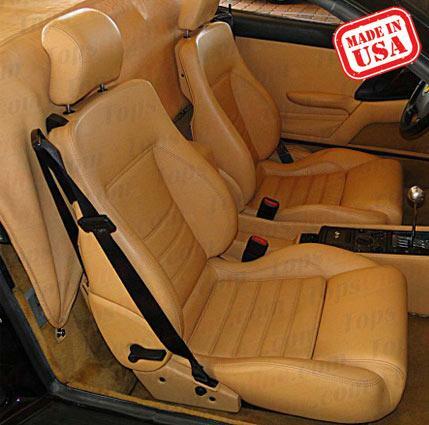 This set of replacement Seat Covers is hand crafted for the Ferrari Convertible Spider 348 & 355 and fits the 1993, 1994, 1995, 1996, 1997, 1998 and 1999 model years. All Leather seat covers, factory style seams and stitches. Fits 1993 thru 1999 Convertible Spider models. Other colors & custom covers can be made, please inquire. You can re-use your existing Backrest back panels if they are in good shape or you can purchase Backrest back panel covers separately to recover your existing panels.